Easter Gayton Amos, 88, of Dawsonville passed away Saturday October 8, 2016 at Gold City Nursing Center following a period of declining health. 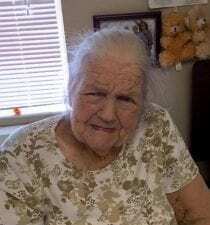 Born April 8, 1928 to the late John and Lucy Gayton, she was a lifelong resident of Dawson County. Easter worked in farming her entire life and enjoyed gardening and canning what she grew. She was a member of Sweetwater Baptist Church and was preceded in death by her husband, Paul Amos, and several sisters and brothers. Surviving are her sister in law, Annie Maude Gayton; niece, Peggy Kent and her husband Larry; nephews, Lamar Gayton, David Gayton; great niece, Emily Kent, all of Dawsonville and a number of other relatives. Funeral services will be held Tuesday October 11, 2016 at 2 o’clock at Bearden Funeral Home Chapel. Rev. Gene Carnes and Larry Kent will officiate. Interment will follow in the Salem United Methodist Church Cemetery. The family will receive friends Monday from 5 until 8 at the funeral home. In lieu of flowers the family requests donations be made to Bearden Funeral Home to assist with final expenses.